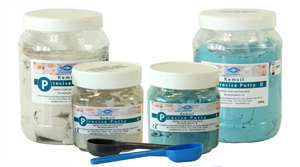 Kemsil Precise Lab Putty uses the latest addition-cure silicone technology with up to 70% less shrinkage than conventional condensation-cured lab putties. Designed for the production of copy denture moulds, processing denture repairs, construction of partial dentures and cold curing CoCr saddles. Sets in just 5 minutes with a shore A 90 hardness. Designed for accurate duplication of master moulds. Outstanding levels of accuracy and precision with excellent thermal and dimensional stability.